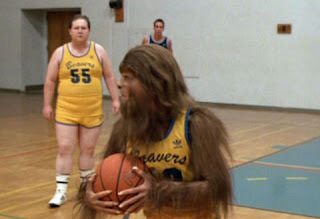 1) Scott Howard has the worst jump shot ever. How could anyone lead a team to that many great victories with a complete lack of skill? 2) Coach Finstock is the smartest man alive. "There are three rules that I live by: never get less than twelve hours sleep; never play cards with a guy who has the same first name as a city; and never go near a lady with a tattoo of a dagger on her body. Now you stick to that, and everything else is cream cheese."